This is the 57th in a series of articles analyzing major companies traded on the tech-heavy Kosdaq market. -- Ed. Genie Music Corporation, South Korea‘s second-largest music streaming and downloading platform operator by monthly active users, is gaining investor attention on anticipation that it will shake up the local industry through a forthcoming acquisition deal. On Friday, Genie Music’s market cap in market‘s close came to 337.5 billion won ($303.4 million), the 153rd-largest among some 1,200 firms listed on the second-tier Kosdaq. Its share price reached 6,860 won, up 2.2 percent from Thursday’s closing price. For the past 20 trading days since May 24, Genie Music share price jumped 19.7 percent, in part thanks to institutional net purchase of some 950,000 shares over the cited period. The firm, however, suffered a volatility in share price the recent week. After seeing a 9.3 percent upshot last Monday, Genie Music dipped 6.6 percent the next trading day. In a digital music service industry, securing revenues through paid subscribers is key to a company‘s performance. For example, Kakao M, operator of Korea‘s largest music streaming service MelOn, saw its number of subscribers soar by nearly 70 percent in the past five years. Over the cited period, the market cap of the service provider and owner of record labels jumped more than sixfold in five years to some 2.3 trillion won. This is true especially to Genie Music, where 98.5 percent of income was generated from services related to digital music circulation in the first quarter this year. In the short term, however, efforts to do so may lead to a setback to the performance. Genie Music experienced a drop in yearly operating profit in 2017 by 51 percent on-year, as the cost of marketing and promotion to secure subscribers overshadowed the rise in revenue by 39.9 percent. 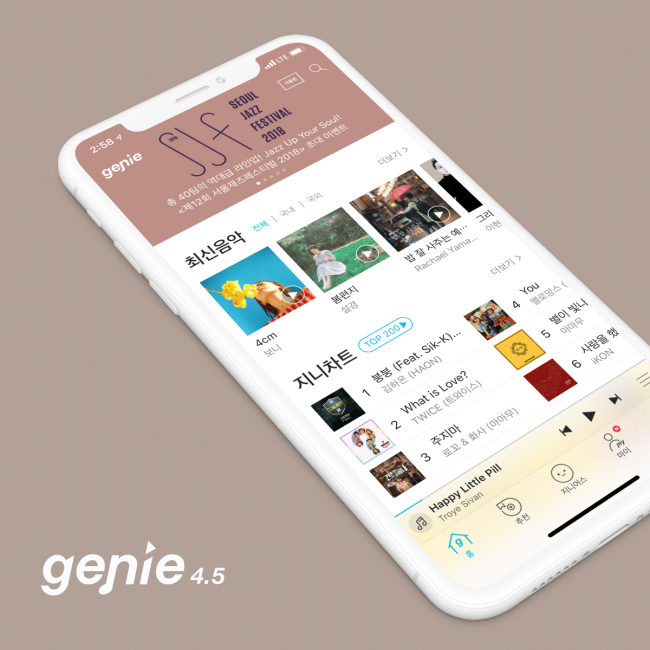 On April 27, Genie Music said in a regulatory disclosure that it is considering taking over CJ Digital Music Corporation, operator of fourth-largest digital music platform Mnet.com by monthly active users. CJ Digital Music is wholly owned by entertainment giant CJ E&M. The company is obliged to release an additional filing, containing details about the deal, by Tuesday. Genie Music is an affiliate of state-led telecommunication and mobile phone service provider giant KT Corporation. Genie Music has provided a promotion service to new smartphone owners by mobile carriers KT Corporation and LG Uplus. KT and LG Uplus are major shareholders of Genie Music, owning 42.49 percent and 15 percent, respectively. Founded in 1991, the Seoul-based company was listed on Kosdaq in 2000. The company earned its new name, Genie Music, upon LG Uplus‘ acquisition of 15 percent shares in 2017. If the deal with CJ Digital Music is put in place, the number of subscribers to Genie Music’s service is expected to rise by at most 600,000, from currently 2.5 million, according to Lee Hyun-dong, an analyst at NH Investment & Securities. The number of annual monthly active users of the two companies‘ services in 2017 came to a combined 15 million, while that of Genie Music came to 10.4 million, according to a disclosure by Genie Music. This narrows the gap between the leader Kakao M and the runner-up. MelOn had 34.5 million monthly active users in 2017. Moreover, the average revenue per user of Genie service is expected to see a constant rise because of the growing number of customers who subscribe to the paid services, Lee added. Lee estimated the revenue from paying customers to rise 42.3 percent on-year in 2018. Another analyst, Lee Ki-hoon of Hana Financial Investment said expectation on Genie Music’s acquisition deal has been a “decisive factor” in investor appetite.